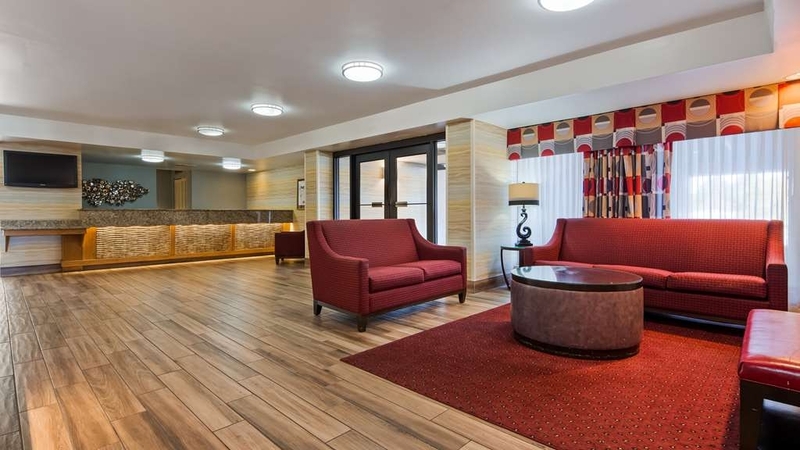 Das Best Western Holiday Lodge ist ideal in Clear Lake Stadtzentrum zu finden. Erleben Sie ein schöner Aufenthalt in der Nähe von alle Sehenswurdigkeiten. Bestpreisgarantie und exklusive Angebote. Erleben Sie wunderbare Landschaften, eine interessante Geschichte, gute Einkaufsmöglichkeiten und mehr in diesem Hotel in Clear Lake, Iowa, in der Nähe von Clear Lake, Surf Ballroom und Main Street. 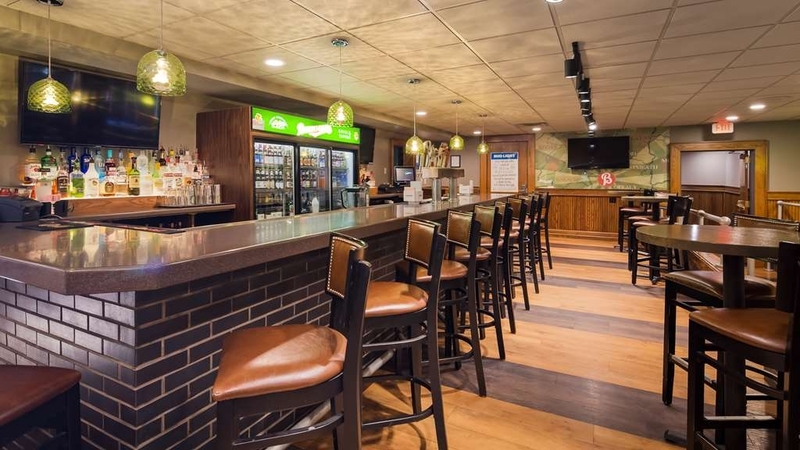 Das Best Western Holiday Lodge liegt am Autobahnkreuz von I-35 und Highway 18 (Abfahrt 194), sodass Gäste die beliebtesten Attraktionen der Umgebung leicht erreichen. Aktivurlauber sind nur 1,5 km entfernt vom funkelnden Clear Lake, mit Angelstellen, Bootstouren, Jet-Skiing und Ausflügen an Bord des Auflugsdampfers „Lady of the Lake“. Die Umgebung bietet auch zahlreiche Möglichkeiten für Wanderungen, Radtouren und Golf. Dieses Hotel in Clear Lake ist nur wenige Schritte entfernt von der Main Street im Stadtzentrum, mit Restaurants, Geschäften, Antikläden und mehr. Besuchen Sie ein Konzert im legendären „Surf Ballroom“, in dem Buddy Holly zum letzten Mal auftrat. Auch die Stelle seines tödlichen Flugzeugabsturzes ist nicht weit entfernt. 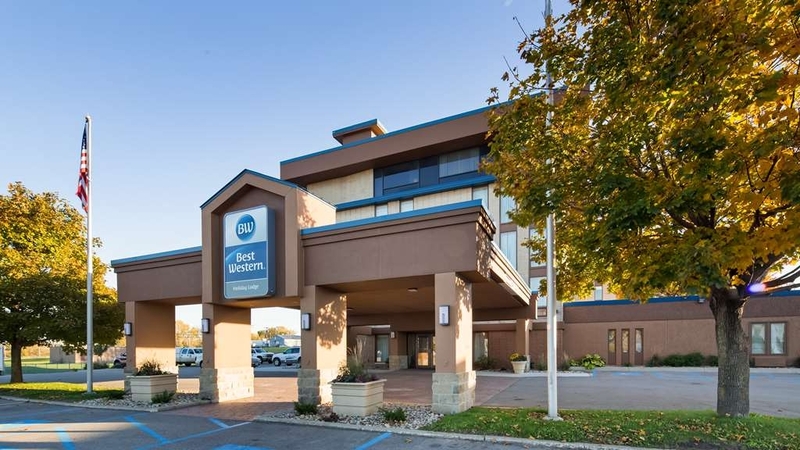 Das Best Western Holiday Lodge liegt auf halber Strecke zwischen Des Moines, IA, und Minneapolis, MN, und ist die ideale Wahl für Geschäftsreisende, die vor allem die unmittelbare Nähe zu Unternehmen wie Stellar®, Titan Pro, CL Telephone sowie zu Windparks und zur Werksanlage von Winnebago in Forest City, IA, schätzen. 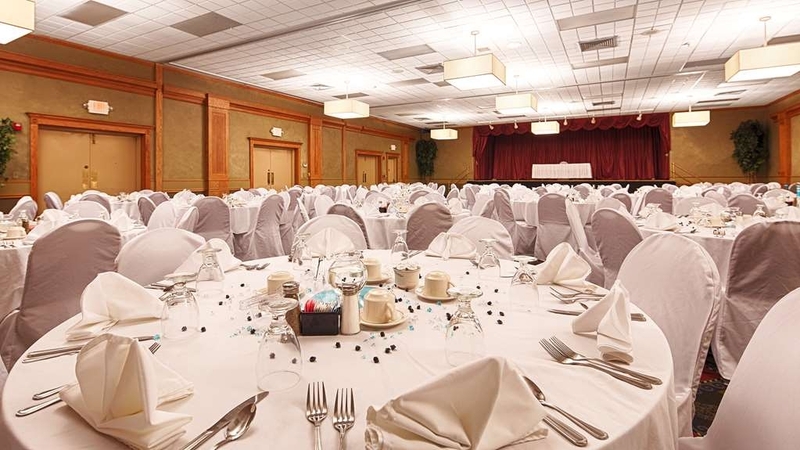 Dieses Hotel in Clear Lake ist auch ein beliebter Veranstaltungsort, mit 550 m² großen Tagungs- und Banketträumlichkeiten, die ideal sind für Hochzeitsfeiern und Kongresse. Der Kommunalflughafen von Mason City liegt nur 1,5 km entfernt, und das Hotel bietet einen kostenlosen Hoteltransfer. Das Best Western Holiday Lodge ist eines der wenigen Hotels mit vollem Serviceangebot in Clear Lake und beteiligt sich an Umweltprojekten wie „Global Soap“, damit unsere Gäste sich bei uns wie zu Hause fühlen. 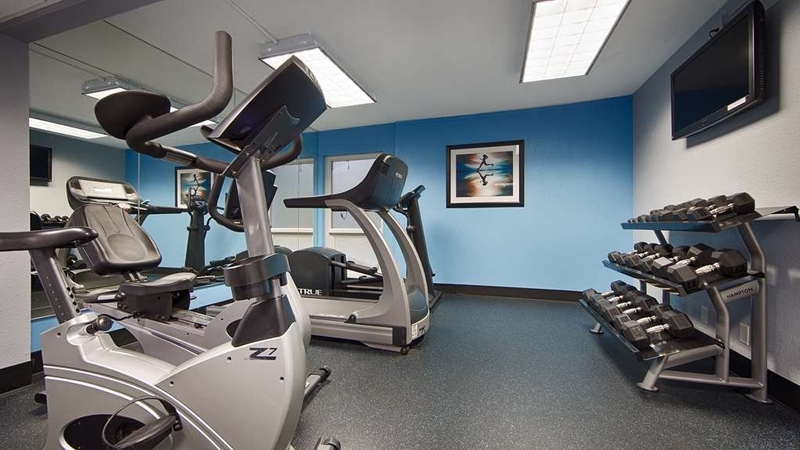 Nochmehr Komfort versprechen unser Fitnessraum, das beheizte Hallenbad und der Wannen-Whirlpool sowie das hoteleigene Restaurant „Bennigan's® Grill & Tavern“. Wenden Sie sich noch heute an unsere freundlichen Mitarbeiter, um Ihren nächsten Aufenthalt im Best Western Holidy Lodge zu buchen! Genießen Sie Ihren Aufenthalt! I have stayed at this hotel many times over the years and have always enjoyed myself. The staff, the location, the food—it's all amazing. This last trip we were put in the new anex buliding int he back. The beds were too hard for any of us to sleep. The rest of the hotel was great as expected. Next time I will request to stay int he main building again. Stayed one night on our way home from two months in the south. 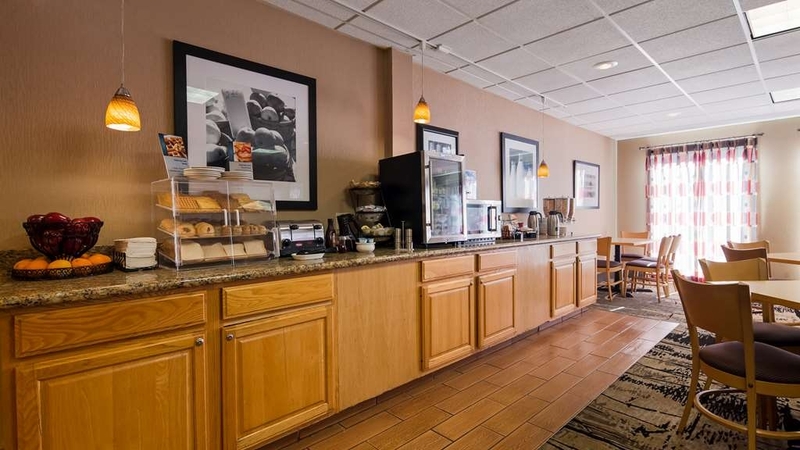 Friendly staff, solid wifi, comfortable beds, clean room, and outstanding breakfast. Would definitely stay again. One of these days we might take time to visit the Surf Ballroom! "Rooms are a little dated. Overall a nice hotel"
Staff are friendly and kind. Rooms are a little dated but very clean. Some hotels have poor water pressure in their showers but I was very impressed with the pressure in the shower. The breakfast was free and very good! Eddie, the guy at the front desk was helpful with everything I needed. I was even able to get a shuttle ride to where my truck was brokedown. This is what I call first class service ! I will definitely be staying here again ! Had a wonderful experience at the Best Western. Breakfast was awesome. Lots of food to choose from. The restaurant food was delicious! The staff was very helpful and kind. Very informative. Clean rooms. Will stay again when in town. If you like bugs, this is the palace for you.... Crickets, moths and spiders is what we found. Others have complained about bed bugs. Hotel said they inspected for bed bugs and found none but we sent them pictures of the bugs found in our room. Bugs in the bathroom, bedroom, open the curtain and find spiders. Large convention in town, all hotels booked so we had little choice to move. It has taken 6 months of complaints and all the hotel could do is give us some BW points. We stayed last summer, found bugs in the bathroom, took pictures, notified the front desk, they sent maintenance, he opened the curtains, he found spiders, took pictures, they offered to move our room, but guests down the hall complained about bugs in their room so we asked they thoroughly clean the room. End result..... Jumping red spider in the bathroom. More pictures, and more bugs... So if you are an entomologist this is the place to stay, you will have lots of specimens to observe and study. Want pictures, we added one here from our room or just ask us or the hotel, we sent them a number of pictures. Great stay, greeted by friendly staff and fast service. Loved the first name basis and the room were excellent. Try the cookies, just like being at home. I would tell anyone that this hotel was by far the best I have stayed at in years. Excellent hotel! Wonderful service! Best swimming pool temperature of any hotel I've been in. Wasn't cold like most hotel pools. Rooms were very well decorated and clean. Plenty of outlets near the bed for charging devices. Can't say enough!!! "dog allowed to poop in lobby disgusted me"
As I was checking in, a dog comes trotting into the lobby and poops on the floor! Very disgusting! Dogs should be kept in kennels when inside the building if they are not trained. Food was good and staff was nice. "Don't expect them to right thier issues"
Broken shower for two days lost reservations for 5 weeks of my 8 weeks their .No towels in room .Room smelled . They didn't make any of this right. The made jokes about it and said we will sell the room wether you stay or not .They did not care . The Best Western has been welcoming visitors to Clear Lake, IA for a long time. In her youth, she was THE PLACE to stay...a luxury get-away. Age doesn't reduce quality. This hotel is very well maintained and updated and I'm glad it's still part of Clear Lake. The staff is wonderful, rooms are clean, the beds very comfortable, breakfast is above average. 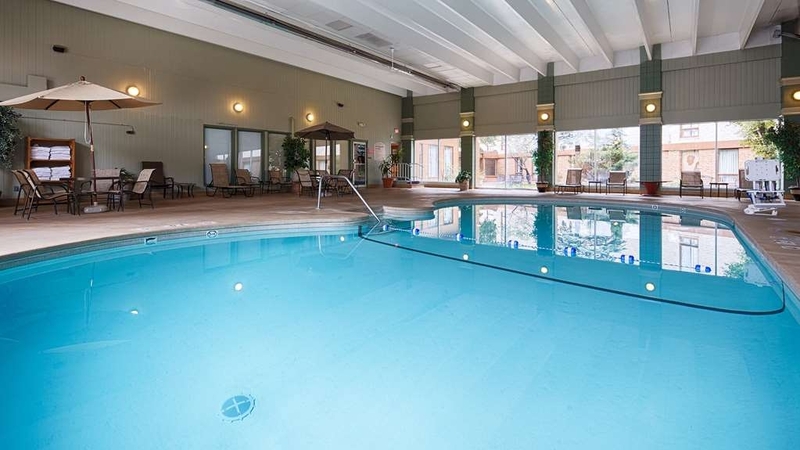 There is a pool and hot tub, manager's reception and Bennigan's restaurant & bar is attached to the hotel. I would like to see the price tag slightly lower than it is for the fall/winter months. I can understand the higher price for summer in this tourist town. Stay here when in town. last time we had problem getting room quickly, not this time. Rooms are clean. Service friendly. Nice breakfast. Will be back. Handy location and connected to restaurant that service nice food and good service. We were part of a large room block, and only one minor complaint in our group that I heard. We paid $145/night incl taxes/fees on a busy holiday weekend, which is well above the value. We were in the back, two-story building, which is connected by underground tunnel to the main building, has its own parking area, and has no elevator (not helpful with a big cooler and big suitcase or mobility-challenged guests); quiet entire visit. Housekeeping did not vacuum our room during 3-night stay, and one day just pulled up the bedsheets instead of making the bed, but otherwise room was clean and had everything it needed (wish I hadn't left tips). Front desk staff was friendly and competent. I was disappointed they did not have recycle cans in the room, nor did I see any in the hotel itself. Was glad to have Bennigan's attached to the hotel; we visited twice during our stay. On a return visit to the area, I would likely do AirBNB/VRBO to be around the City Park area; several friends in the group went this route and were pleased with their experience. This hotel is very outdated. There seemed to be a problem with moisture at the hotel. Everything felt damp. There was water dripping from the HVAC vents in the breakfast area. Room was dark and damp. The x's in this review are because it is forcing me to enter 200 characters. Great location in the Clear Lake area. Staff is very helpful and knowledgeable. Breakfast very good. Older facility. but well maintained. I always stay here for the family reunion. However, must remember to reserve room early, since they fill up. We have always enjoyed staying at Best western hotels in the past until now. We were given a room in the back building of this hotel which had 2 entrances to your room. They told us we could only enter our room through the main hallway then we could unlock the outer door from inside our room. The room was clean, but seemed to be run down and was infested with at least 30 flies and gnats. We are assuming the outside door was left open while people partied outside because there were some chairs there. When I told the front desk of the problem and asked if they had a fly swatter they were rude and did not want to give up their only one. We should have asked for a different room, or checked out. We will never recommend anyone stay here!!!! Hotel was clean. Staff was friendly. Breakfast was good could have a bit more variety. Location was easy on - easy off. Room seemed a bit small but it was comfy. We would stay at this hotel again if in the area. "Comfortable, clean, well run hotel"
We enjoyed our stay and rank it in our Top 3 in our 20 years of traveling. We stayed here for seven days and had a room with two queen beds. The room had all the standard features -- fridge, microwave. The outstanding in-room amenity was a 50-inch TV and really thick light blocking curtains. The beds were extremely comfortable. We slept well. Breakfast is fantastic! They have all the customary breakfast items but on overload. Tons of small pastries, fruit, cereals, both milk and soy milk, juice and yogurt bar. I really enjoyed the coffee. It was top notch! They offered three hot buffet items: eggs, biscuits and normal fixings and a make your own breakfast burrito which was nice. I love the automatic pancake machine. It made small pancakes and they were rolled out on a conveyor belt. Cute!! Plus, The food area was immaculately clean. The lady in charge here was on top of it! The pool is kept at a perfect temperature and the hot tub was clean. We enjoyed Bennigans, which is in the hotel. They give hotel guests 10 percent off meals and drinks. They offer happy hour specials, too. We give it two thumbs up!! There were only two cons. They are small compared to how well this facility is run. (1) The parking spaces are VERY short. We drive small cars and the space lines were 2/3 of the length of our car. It's a popular hotel and the lot can be packed. (2) No USB ports in the room but there are tons of electric outlets. Really well run hotel. Dont let the age of this facility scare you away. Common areas and rooms have all been updated. Management and staff take excellent care of their guests and the facility. Their complimentary breakfast is great. I'll be back!! "Great rooms and Luke is great! " Had a great stay here! Luke at the front desk is awesome. They have guest laundry, fitness center, WiFi, free parking...our room was clean and cozy. Awesome free breakfast and you can even get room service from the restaurant on property. Highly recommend this hotel! "Do not count the sofa bed for sleeping arrangement"
Recently stayed July 1 and 2nd. Had booked a king room, and when we checked in, we were told the king rooms were overbooked. But what a great surprise, we were upgraded to a suite! Room 501, right on the end, right off the elevator! So peaceful, convenient and really nice! A pleasant stay, the staff could not have been nicer, the hot breakfast is good, too. Would definitely stay again! Added bonus: in town for the Clear Lake 4th of July festival at the lake. Great time!! We arrived about 2:30 to check in. Were told by man at desk to wait 30 minutes for room because they were full the night before. We left and came back and were told no room ready yet. Waited another 45 to 60 minutes. During this time 2 or 3 people came in checked in and got room???? Finally were were told we would get a different room? Not sure why we were not given it before. We had not requested a certain room. Made for a rushed evening of dance and skipped dinner out. We will still stay there next time, but will make sure what is going on. Did have rear room which was ver quiet. "Don't stay in the annex"
We booked this room knowing we'd come in later at night and be out fairly quick in the morning, traveling though. We arrived late with a sleeping toddler, my husband checked in and was told we'd be on the 6th floor, i got in the elevator only to find out the 6th floor is actually the first floor of the annex building. the walk is pretty far to get there and they didn't tell us the annex has walk up parking to the back side of the building! so instead i carried all the luggage through the entire hotel rather than them telling us we could park right outside our room. Also, train came by fairly close at 2 am with his horn going. The 1st building and lobby looked amazing, but the annex was very old and felt like an outdated motel. i will not be staying here again unfortunately. 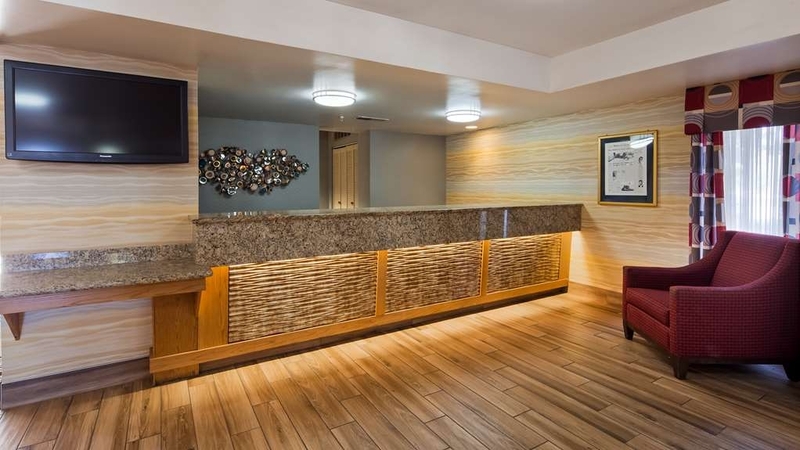 "One Of The BEST Motels In Clear Lake"
We were very impressed with this motel !! Highly recommended to stay here and worth going out of your way if you have to in order to do so !!!! This is a 10 star motel and professional in every respect !! The service and quality of this place is just unbelievably fantastic and they allow for dogs there !! I think that too speaks for itself !? This was our first stay at a Best Western and you can be sure we will be staying there again !! HORRIBLE!! !The room i received for the amount of money i paid was small and cramped, it was like being stuffed in a closet. When i received my rollaway it had blood stains on it. The elevator was small and slow, and with the hotel being so busy it took 10 minutes just to go between floors, I spent most of the time walking stairs. Staff was friendly, engaging, and helpful. All were professional from the desk staff to those that served at breakfast. Rooms were small but very clean and quiet. We were very happy with what we received. The service and the environment were excellent! I would recommend this hotel to friends and relatives. The rooms were clean and the beds were comfortable. The proximity of the restaurant was convenient and the food was very good. I found myself back in clear lake and after staying at two other hotels I decided to try here. I was not disappointed. The property is older but maintained well. Breakfast was great, room comfortable, staff pleasant. This will be my new stop next time I'm in the area. I grew up about 20 miles from this hotel, even had our senior prom there. Now we found ourselves back in the area for a funeral, and we got a good deal on this place. Wasn't quite sure what to expect beings the property has been around so long, but the reviews were decent. We weren't disappointed. 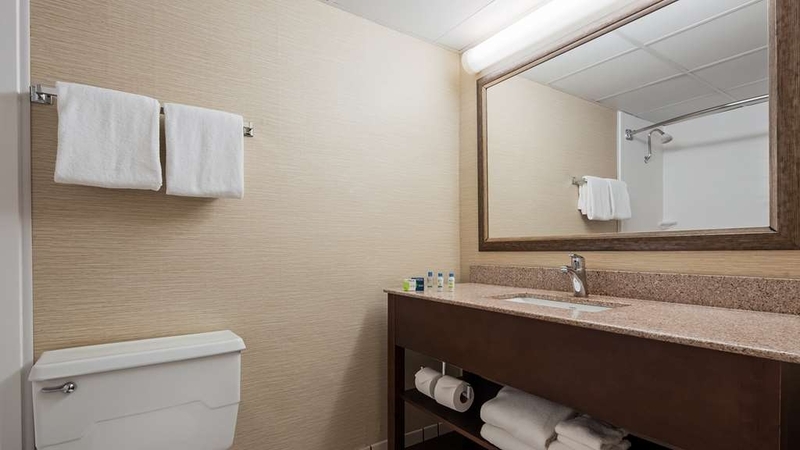 The rooms were recently redone, and were very clean and comfortable. It had probably the largest and nicest TV I've seen in a hotel room. Our boys enjoyed a swim in the pool, and in the morning we had one of the nicer free hotel breakfasts I've ever had. As an engineer I was particularly intrigued by the pancake "printer" which outputs very tasty pancakes in just seconds. The staff were very friendly and helpful as well. All in all an incredible value for what we paid. 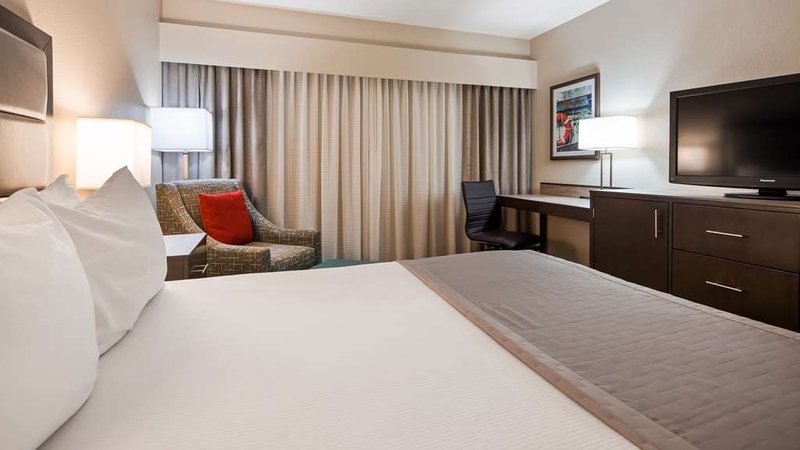 We'll keep this place at the top of our list for future stays in the area. We were forced to stop because of snowstorm and stopped here. Staff super accommodating and allowed us to check in @ 11:00 in the morning. Room very clean and had everything we needed. Ate at the adjoining restaurant and the food was awesome. Restaurant staff very friendly. Chief even came out ask about our meal. Great hotel. You won't be disappointed. This hotel is nice and very clean. It's not new but very well kept. The staff was very friendly and helpful. Breakfast was excellent and the choices were quite varied. The person stocking the breakfast items never let any of the choices get low. Would stay there again. "Toilet overflowed within the first hour and no one would come to fix it"
On Saturday Feb 23, 2018 we checked in about 3 pm. At 4 pm right before we needed to leave to attend a concert, the toilet overflowed. We called front desk and they said maintenance would be up while we were gone. We came back to our room about 11:30 pm to find the water/wet towels still on floor of bathroom and the toilet still not working. After many calls to front desk and promises of maintenance coming, a plunger was left outside our door about 1 am. We were also told another room was not available for us to move into. My husband is currently trying to get the toilet working. We have never had such poor service at a hotel and would recommend not staying at this particular Best Western. We were in town for a funeral & needed a pet friendly motel. This one sure filled the bill & more. 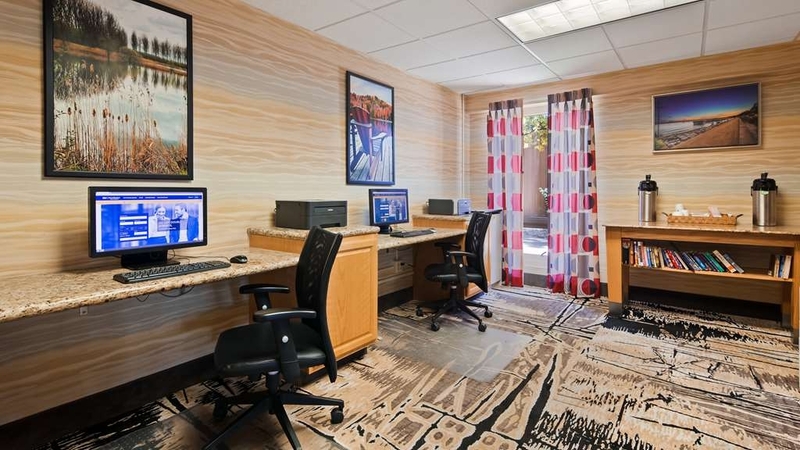 Very helpful & friendly front desk attendants, nice sized room that was clean w/ comfy beds. The breakfast was great-wide variety including pancakes. All this at reasonable rate. "The best place to stay when you visit the Surf Ballroom"
The Best Western in Clear Lake shows its age a bit, but the friendly staff more than make up for it. The free breakfast is great and the pool area is large and clean. This is the place to stay during the Winter Dance Party! 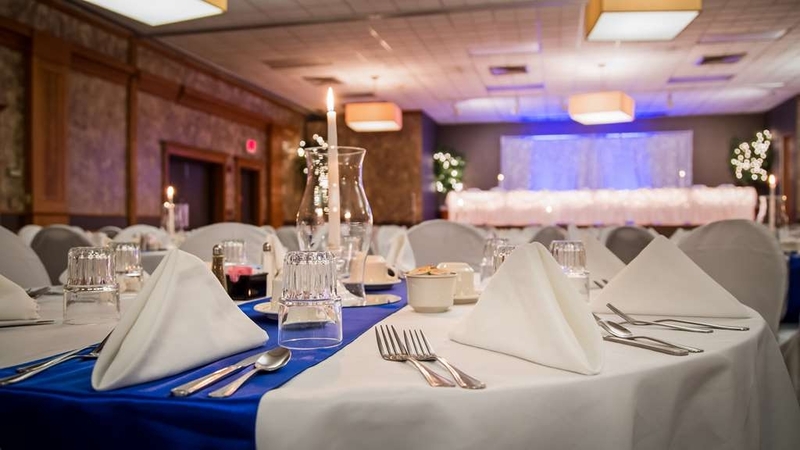 Make sure you visit the Surf Ballroom during your stay. Lots of parties here this weekend, nothing to get too excited about. Friendly check in even though they forgot to reserve the room. I was lucky to have the room I did have. Pretty comfortable beds and nice stay overall. "Over night stay to visit the Surf Ballroom & Buddy Holley Crash site." After a great car club meet in Bloomington,Illinois I went 360 miles to Clear Lake Iowa on I74,I80 & I380 to check out the Surf Ball Room & Buddy Holly crash site as it was on my list of places to see if I got close to the area. It was too late in the evening to tour so I overnight-ed at the Best Western Holiday Lodge for $80 a night at that time,Very friendly staff & a clean room with a big buffet breakfast in the morning. The hotel can give you a route map on how to get to the Buddy Holley crash site which is 10 min (6.4 miles) north on a gravel road. After checking out I went to visit the Surf Ball Room which has amazing memorabilia & history of the the performances of the fallen three & many others that played there to the current stars of today. Then on to the Buddy Holly crash site which is on gravel roads so go slow around the corners & fallow the map to the giant pair of black glasses that mark the entrance spot. It's about a mile & half walk into field to the site from the road,But well worth it as it is part of American Music history & being there I got the feeling of being transported the to that period of time when the music died. Dear Valued Guest, Thank you for the 5 star review. The crash site is a must see if you are stopping in Clear Lake. We recently made changes to our breakfast so we are happy that you enjoyed the changes! Hope to see you again if you are in the area. "Love this Best Western "
Great hotel. Staff so helpful! !!! My room was spotless and very comfortable. Great bed, pillows and linens. I love the layout of this hotel. I had an interior and exterior door. So easy to load and unload car. Easy to get to restaurant from inside, keeps you out of the cold. The restaurant has room service if you don't want to leave room. Will mark this as a favorite for future business trips. Very courteous and helpful staff, spotlessly clean room. Very comfortable bed. Great restaurant and lounge and to top it off a more than adequate delicious breakfast. A must do for travelers in the Clear Lake, Iowa area. "Great hotel, staff and value"
Was in town for a funeral, Stayed 1 night. Staff was professional and courteous. Room was large and comfortable. The king bed was semi firm and provided a good nights sleep. . Breakfast was above average for this type of hotel. Great hotel and staff, good value for the money. Right off the I-35. Recommended. "Good value and it has a restaurant!" Nice staff. Rooms were clean and quiet. Good value for the $$. LOVE the fact that the hair dryer is not attached to the wall! It's also nice that the restaurant is attached. On a cold night it was a welcomed amenity. The entire staff at this location is amazing! Very accommodating and friendly. The hotel itself has small rooms but they make up for that with style and staff. I would recommend staying here for business or leisure. My family and I have stayed at this motel several times when hunting in the area. We have never been disappointed. The rooms are always clean and comfortable, and the fact that our dogs can be in the room with us is a definite plus. This is the only place I consider staying at when coming to this area. Helpful staff, clean rooms, a bit pricey for the size of the rooms. Liked having restaurant attached, but food was ok, not outstanding and breakfast was mediocre, not many low fat or sugar free choices. Have stayed at this hotel alot in the past month for business. Have never had any problems. Room always clean, bed comfortable, breakfast awesome. Staff very friendly and helpful. Hotel is quiet. Glad I chose to stay here. We had an extended stay at best western clear lake ia. Staff were very friendly and helpful, made you feel at home. The rooms were clean, and they have a great breakfast. Would highly recommend this hotel! "Lack in cleanliness and customer care"
My room was big, clean and very welcoming. The fitness center helped me wind down at the end of the night. The location was in close proximity to the business to which I traveled for work. Great experience. Will stay at Best Western again. I stayed for 2 nights on a business trip. The front desk staff are super friendly and professional. The breakfast was good. There is a Bennigan's next door which is convenient, but I don't recommend the food unless you just want bar food (fried things). There are plenty of options for eating in nearby Mason City which also had lots of shopping, including a Staples and a Best Buy (both of which I needed for work supplies). Hot, fresh cookies at the front desk are yummy! Everything was clean and maintained. Decor is nice. Apparently this is a pet friendly property (I was not traveling with a pet). There seemed to be plenty of parking for large vehicles (RVs, trucks, etc) in addition to the regular car parking. The hotel was nicely updated with good decor in the room and the lobby. Staff was very helpful. The hotel provided a shuttle to the Surf Ballroom for the show we were going to. Breakfast was a bummer because it was extremely busy. overall good place to stay in Clear Lake. The room was great. The curtins kept the light out at night. The heating and cooling came from the ceiling and not by the window. We had a room by the elevator and barely heard it. I slept like a baby. "Quiet place with parking for our truck & Trailer"
Nice place that's away from the freeway, close to restaurants and fuel for RVs or trucks... Clean hotel with excellent staff working the front desk! Breakfast was good with several options... Also dog friendly! This BW Property and especially the staff are a gift to travelers. The Staff especially saw to our every need and did everything with a smile. We are frequent travelers and always stay in BW and this one tops them all. They should be given the Plus award! Each staff I encountered was very informative and willing help with directions to places of interest. The facility room was clean, with comfortable bed and a spacious area for me to finish my work in the evening. Fresh cookies awaited in the lounge each day after returning from a long day of work, this was well appreciated. This hotel and its adjacent restaurant (Bennigans) was a wonderful find after a long day of travel. The hotel and its rooms, staff and location were all great. Easy to find and easy access to the highway. The restaurant was a Bennigans and was very satisfactory in both food quality and ambience. Would stay here again. Wonderful room. Great staff for check-in. Breakfast was "ok"; not stellar, but not bad either. Very clean rooms. Bennigan's is attached and there are several other restaurants nearby for food. I'd stay here again. No staff assistance when we booked a handicap room for the first floor, when we arrived at Best Western hotel they told us they had no handicap room, and was not going to be able to find a room on the first floor, they we standoffish because we booked through TripAdvisor, also found out the rate we paid through TripAdvisor was higher than the local rate at the Clear Lake Hotel. "Great Hotel with a wonderful breakfast!" I was here for business and enjoyed the hotel. The restaurant with the hotel, Bennigans, had great food for a reasonable price and the free breakfast was outstanding. it was easy to get lost trying to find the meeting room but other than that I really enjoyed my stay. I was a little surprised the restaurant wasn't busier since the food was top notch. "Room & staff were great but no wafflemaker"
We enjoyed our 3-night stay. Great location, room, service and staff, but breakfast was lacking. No self-serve waffle or pancake iron. And no biscuits & gravy until our final morning. Other breakfast items were average. Breakfast could have been better but it was hot and a buffet so it could have been worse. Had a hotel van pick me up from the shop where my truck was. Got a discounted room rate. Ground floor has a back door to outside to accommodate smokers. Bennigans pub had really great food both nights that I had dinner there. Beer was 3.50 a pint iirc which is an ok price I guess for a hotel. Wedding and the wedding party were a hoot. The service received at the bar could have been more sincere and nice. The rooms were a little small but the beds were comfortable. The breakfast was hot but the staff had a hard time keeping everything stocked. When asked to get something it did take a bit. we were extremely satisfied with the hotel especially having a restaurant attached.... everything went well from checking to check out the next morning. we would stay at this hotel again. 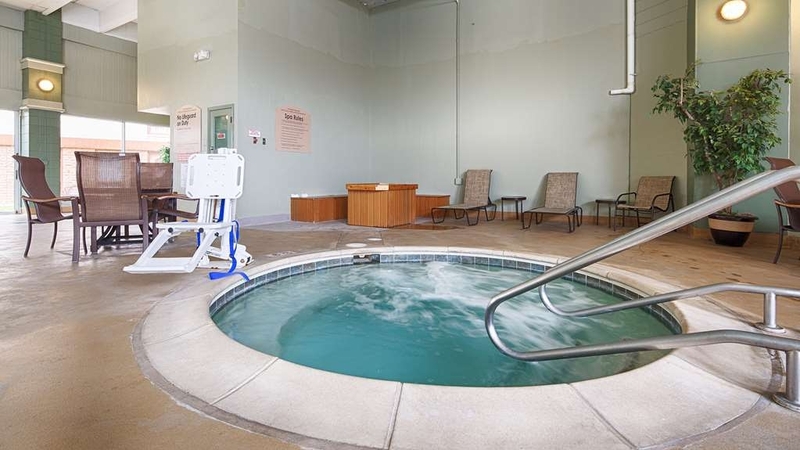 my husband needs handicap accessible rooms and they were very helpful. Excellent hotel! Clean, friendly, rooms set up very well, comfortable beds and great pet policy. We were very impressed with the complete breakfast and the rooms that accommodate pets at the courtyard are stellar-thinking. The staff were very friendly and willing to help with any questions. The room had been refurbished. The pool was exceptionally clean and a good temperature. Bennigan's is the attached restaurant and we would not recommend it. Service was slow and they were understaffed. Took a long time to get food. We have used this motel for a meeting site for our annual family reunion for many years. The service and rooms quality are consistently good. The restaurant is very good and the free breakfast is consistently good. The facilities are consistent. 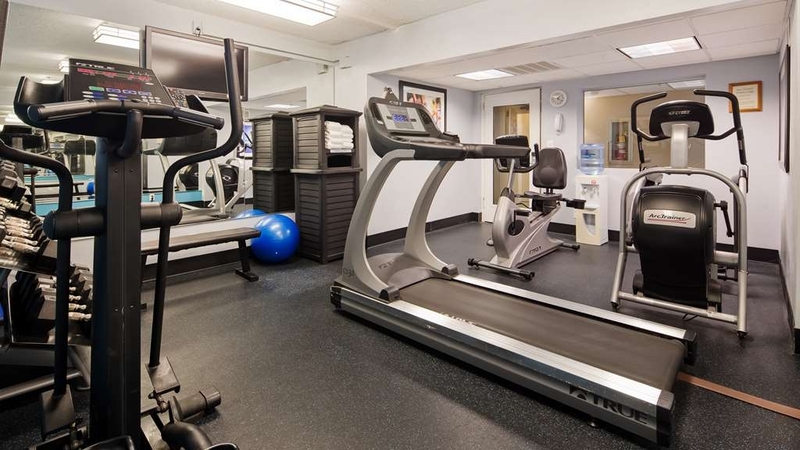 The bar, the pool, exercise room are all good. service was good. staff was very friendly. they disagreed with me, as to whether I had made requests for lodging. She finally found that what I said was correct. Kinda of uncomfortable. Then room to hot. Breakfast was good. We stopped in Clear Lake for the night. Hotel had so many motorcycles parked by front door to lobby, had to park and walk from lot to lobby just to see if there was any vacancies. Front desk was very nice, The price she quoted was 149, I asked about discounts, as I have a couple of memberships, all I got was 10 % off. I see on web site the rooms are much less than what we paid. Main hotel was full, our room was in a "back" building, Second floor no elevator, to be fair room was clean and bathroom was good, Building on outside needs to be cleaner, cigarette butts, and beer cans all over, the back building was obviously an older building but could have been cleaner. On the plus side, breakfast was great, they had gluten free options and almond milk. "Clear lake Iowa last place buddy holly played "
Great hotel free rides to the ballroom where are great show are going on. This town has great Resturant's just ask the front desk. Just down the road from the lake great place to spend the day down town clear lake. The hoilday lodge does a great job if you do not like the lake they have a pool. Great parking if you have something big. Very clean, awesome staff, nice stay :) I asked for a fan to sleep with and they delivered one to my room, they were very accommodating. I asked if I could leave my bag as I was biking across Iowa for RAGBRAI and they let me leave my bag and I stopped back to the hotel and grabbed it later. The breakfast was clean and plenty of offerings. I would highly recommend this hotel to others. Room was very nice and clean. Furnishings were nice. Check in was smooth and easy. We didn't have breakfast, but it sounded nice. Easy location right off I-35. RAGBRAI is what brought us to the area. Keep up the good work. Very nice place. Friendly and helpful staff. Breakfast buffet was a bonus! Our room was clean, quiet and easily accessible. Overall we were pleasantly surprised with our visit. We were on town for a wedding and stayed in a block of rooms there. 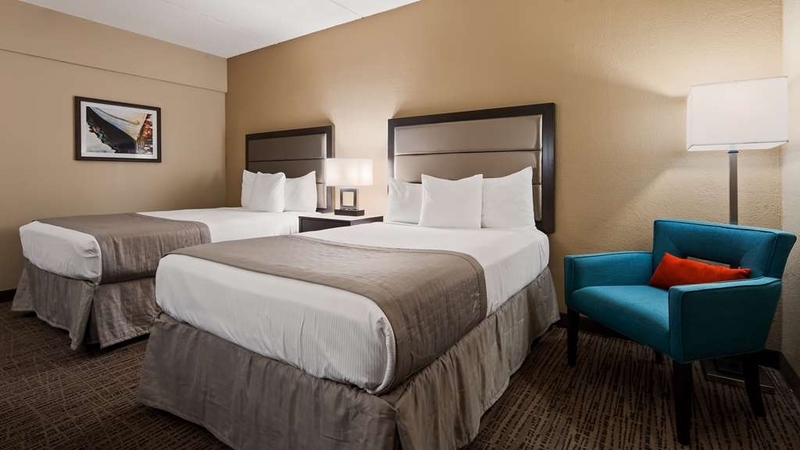 Great hotel for those traveling on business or those visiting Clear Lake for vacation. The breakfast was very good and the staff supporting the breakfast was also very friendly and helpful. The front desk team also provided some great ideas for places to visit in the area. 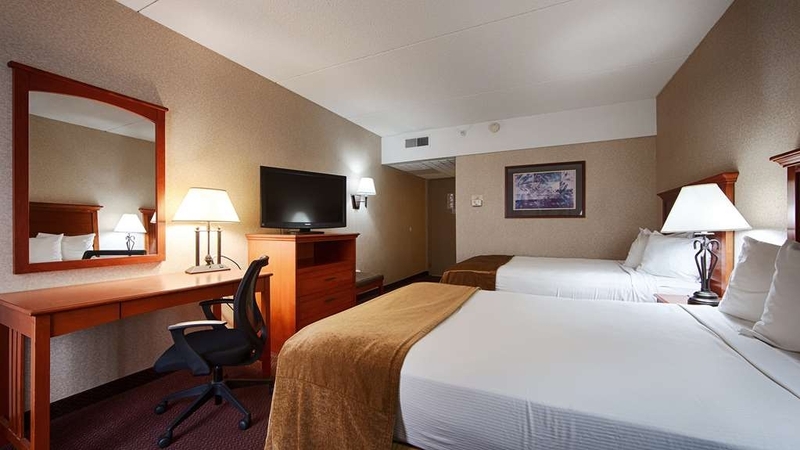 A very nice hotel located right off Interstate 35. The staff were all very nice and helpful. Our room was nice and clean and having a restaurant attached was nice. There are many restaurant and fast food choices within walking distance. We will stay again if in the area. I've rewritten this review a couple of times. We have stayed at this location for the last five years, plus. The building has been maintained, the breakfast has remained constant and the facility has been kept up. The price, however, has skyrocketed!! I have records of this place being a reasonable location to stay as recently as last year. Over the last four years the cost for one night has gone from 109.88 to 238.01. That's absurd!!! I don't pay that much for a night in the Hilton, in Washington, DC., two blocks from the US Capital, and that's a four star hotel. This has been the home for many of the truck club visitors to Clear Lake for many years. As discussed at the closing gathering, when trophies were handed out, this place is not worth it. We stayed overnight on the 4th. Check in was fast/easy, staff was very friendly. Room, pool, and breakfast areas were all very clean. Beds are comfortable. Nothing fancy but it's nice, relatively updated for being an older property, clean, and quiet. No complaints. Would definitely stay here again. "Great Stop For Travelers !" This hotel is very convenient exit from the Interstate. Rooms were clean and very pleasant. The breakfast came as a surprise, as the complimentary breakfast was very good. Tables were always clean and the staff working the dining area were most hospitable. Would stay again if in the area. Hotel was clean and comfortable. Attached restaurant is nice. It is showing its age, but no complaints from me. We did not use the pool or the fitness center so I have no recommendations there. We have stayed in the south wing of the hotel and it was not as nice, but that was years ago and it may have been remodeled since. This hotel looked like it was recently renovated. My room looked brand new, clean, and modern. Bed and pillows were comfy. The bathroom had upscale materials and design. Staff was friendly. Wifi worked well. Only ding is the breakfast. It is free, but my biscuits and gravy were cold. We wanted to visit both Clear Lake and Mason City, Iowa so this location gives you a good center point to reach either city. Clear Lake a little closer than Mason City but only by about 4-5 minutes. The staff at the lodge were well trained but I would hesitate to say LODGE but it is a good BW. "Horrible bed bug riddled room from hell"
This is the worst hotel I've ever been! Bed bugs in the room, roaches in the bathroom, no air conditioning, it was 80 in there! Horrible filthy carpets, the rooms had a stench, we left after an hour , so disgusting, don't waste your time even going in this dump. Dear Susan, Thank you for your comments concerning your stay at our hotel. We hope that you will accept our apologies for any inconvenience you experienced. We had Ecolab come and inspect the room that you were in and they found no bugs in the room. We just went thru a complete remodel which included new case goods, pictures, carpet, tub surrounds and new drapes in December of 2016. We checked the thermostat in the room and it was 68 degrees. I am available any time if you would like to discuss this further you can reach me at 641 357 5253 ext 485. 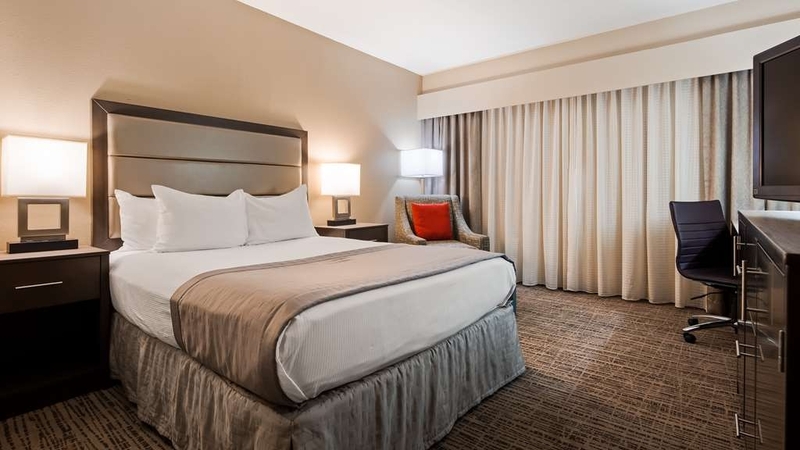 Good hotel, good rates, excellent location, clean rooms. Only complaint is the hotel was packed, holiday weekend, the breakfast person over slept and breakfast was a half hour late, people were getting backed up and worked up. Same thing happened the last time I stayed, but then it was the pool guy! You just can't do that especially on holiday weekends! 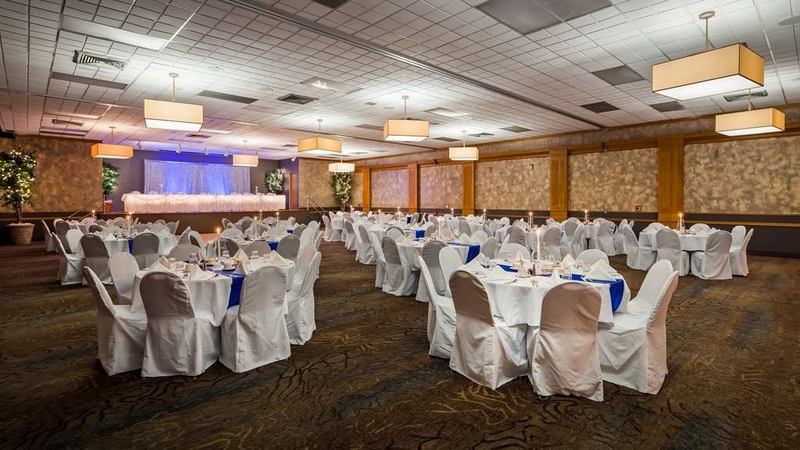 Was a nice place for family and bar worked well with wedding ceremony. Would stay again. Nice location and great place to eat. Kids had fun in pool area and fitness room worked well for burning some calories. "Great place to stay in Clear Lake"
This is a nice place to stay. We came there for a wedding. The room was nice and clean. It is the one room I have stayed in that was actually dust-free! The front desk was knowledgeable and knew the area well. The hot breakfast was pretty good with eggs, sausage, and ham. The pool area was spacious but the pool was pretty busy each time we went. "Good hotel, rude night desk clerk"
The man at the front desk was a complete tool. After I stopped in to have something to eat at the attached restaurant I checked into the hotel. I made my reservation online using Corporate Lodging's website and have never had a property tell me I didn't book the CLC rate. This guy kept telling me I couldn't use the Corporate Lodging card since I didn't book that rate. At some point he's looking at his computer and says "oh" and slides my CLC card off the counter to use. Other than that the hotel was very nice. Clean and well kept. The staff at this facility was exceptional. They all went above and beyond to create a wonderful experience for us. They were very accommodating and went out of their way to assist us any way they could. I would recommend this hotel to everyone based on the service alone..but the facility was clean and comfortable... Excellent! Our stay went excellent! From start to finish every staff member we met was courtious and helpful. The fact that there was shuttle to and back from the concert was our deciding factor in our decision to stay at BW. The breakfast was delicious and there were many choices for everyone. Clear Lake is a nice place to visit, has a beautiful lake and a quaint lake front shopping area. It is close to the interstate highway system for easy access. The restaurants in the area are diverse and unique. "over night stay with dog"
I really enjoyed the room. They had the dog rooms in an area with an extra (back) door going out to a courtyard. It made it so easy to let the dog out at night without having to go down the hall to a side door. Wish more Best Westerns had this option. We were greeted right away. Check in went smoothly. Elevators were small. Carts for luggage did not roll well. Trying to put a cart in the small elevator with more than 2 people was tight. Room was clean. it was a smaller room than what is normal by today's standard. It was double beds. Two of us found the beds comfy, two thought they were firm. Two thought pillows were good & two thought they were comfy but small. There were plenty of lights in the room. There was a microwave & a refrigerator in the room. HD TV was down the entire three nights we were there. Internet service was very slow. The A/C in the first room we were in was not working as we found out when we came back to a stuffy room. They moved us to the room next door, which made it nice not having to carry our stuff very far. This room A/C worked fine. For our phones, AT&T cell service was spotty in the area, Verizon had coverage. Pool was one of the warmest hotel pools I have been in. Hot tub was nice. Did not have that overwhelming chlorine smell when you walk into the area. The fitness room was good. There were four different machines & free weights. I thought it was weird that the TV in the fitness room got different channels then the TVs in the rooms. The room doors seemed a bit on the flimsy side. Same for the stairwell doors. Of course we were traveling with two firefighters who look at those kinds of things. Three of our four members liked the breakfast. There were eggs, biscuits & gravy, ham & sausage on the one bar. There were some oranges, apples, danish & toaster waffles, yogurt, milks, hard boiled eggs, mixed fruit cups, oatmeal, Udi's Gluten free blueberry muffins, & cereals on the other bar. Then of course you had your juices. It was the same breakfast every day, which is why our fourth member didn't like breakfast. Sometimes a variety is nice. Susan was the employee that was in the breakfast area. She was the most friendly lady. She greeted us as we came in. She told us where everything was. Told us if we needed anything to ask. She even came & cleared our dishes for us the one morning. Talk about service! I have never encountered this at any hotel I have ever been too. Susan is a lady who really likes her job & gives it her all. Way to go Susan! We enjoyed our stay here. Front desk was AMAZING. Rooms were clean and loved the attached restaurant (Bennigans). Not much within walking distance besides a mini-mart. There are some rooms in the front section that open to a courtyard which is good for smokers. "Road Trip to South Dakota"
The hotel was very nice! The room was clean and a nice place to sleep for the night. We were traveling with our dog and had to find a place that allows pets, they do. Only had two cons; one being that it was a little expensive for us for a one night stay and the other being that the mattresses were not very comfortable. But we got a good nights sleep so I guess it wasn't too bad. I would stay again and recommend to anyone as long as they don't mind paying the price. We had requested a room with 2 beds because there where 2 adults and 2 children in the room. We got 2 full beds. Worst night sleep ever at a best western. Breakfast was good except the ham had no taste. Must have been boiling it to make ham broth later. Front desk people were great!! Toilet was a little wobbly in the room but other than that it was great!!! Awesome pool area. Lobby looked great and breakfast was stocked well! A great time for my family we were able to get joining rooms! The hotel was nice and the staff seemed nice enough. Breakfast was a nightmare. Went to breakfast at 9:00 a.m. and they had run out of food and took 30 minutes to refill. There were so many people waiting to eat again that they ran out right away. Not much variety available for breakfast. The restaurant staff was not very helpful either. We waited a long time to be served and then they didn't check back until they gave us our bill. we came in very tired, staff was very courteous and quick. rest was good, tv kept kid happy as she had slept most of the day in a car seat. breakfast was highly varied and very good quality. enjoyed our stay. Nice hotel. Rooms were nice quiet dark and a good temperature. Nice firm beds. Pool and hot tub open till 11. Hot breakfast is offered. Always had a nice experience with the hotel. Stayed there many times for business. Friendly staff, smooth check in process. Nice clean room, comfortable beds. Lots of variety on the breakfast. There is a Bennigan's restaurant located at the hotel. We heard the restaurant was good, but did not eat there. "Stayed for a Concert at the Surf"
A bunch of our friends were going to a concert at the Surf Ballroom and we all booked rooms here. Check in was strange, the lady was at the end of her shift I think...not much patience. We were pleasantly surprised to find out that they had a free shuttle to the ballroom, so no one had to drive! The pool area was swarmed with a million little kids. Must be the place to have birthday parties. Was in town for a hockey tournament. Convenient location to dining and also the ice rink. Very good value for the stay. Friendly and accommodating staff. Nice breakfast. Clean Hotel. Would Recommend this hotel. The Pool is a plus. Very quiet hotel with a workout room that is not used by many people. They have a swimming pool and hot tub if you will want to use them. Many items for breakfast, some are hot. They are working on updating rooms right now but it is very friendly. Always excellent accommodation's here. Staff is always great. Has the best breakfast of any of the hotels I stay at. I travel a lot for business and always stay here when I am in town. 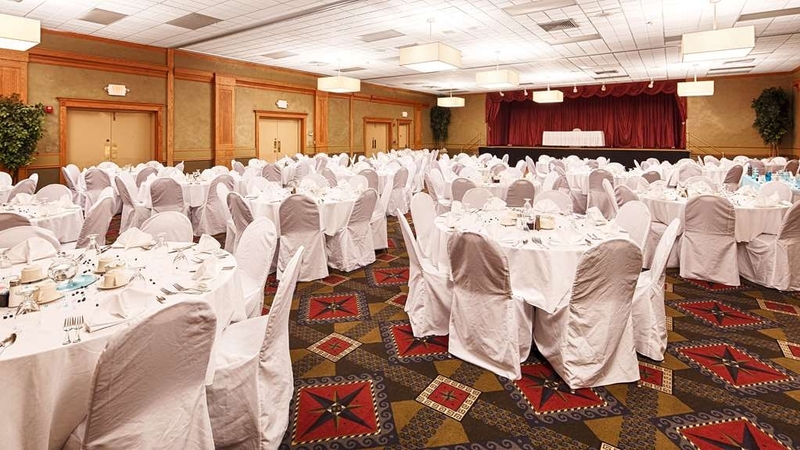 Use this hotel also for many business meetings and they are always first class service and food. We booked 5 rooms. All were side by side and all were great! We were able to check in earlier which was great since we had 85 year old with us. Would stay here again! Staff were awesome! Location was good. First let me tell you, we were exhausted and had a cat as we were on our way to relocating to Florida and it was late at night. We did not make reservations anywhere as we did not want to limit how much we drove each day, but since we had stayed at this hotel for New Year's Eve and I knew they took pets (I remembered watching a woman walk her dog in the courtyard while I was eating breakfast) I called my husband in the Penske truck and told him I was done for the night and wanted to stop. Front desk was great, they gave us a good rate and boom, we were in bed. Good breakfast selections and the woman in the breakfast room was so pleasant, and boom, we were on the road again with a good night's sleep and fed and ready to go again. Room was used , was not the cleanest but also wasn't dirty. Just a mediocre place. The employee's were friendly. A good place to eat was in the same establishment. We did not use the pool but the cookies at front desk was a nice touch. Breakfast was typical but the coffee was great if you could get by the snob at the front desk. We don't plan to return. Average hotel. Rooms were small and not that clean,Dust was thick on the bottom of both night stands and the room showed lots of wear and tear. Had a strong smell of mold in the hallway and the first room i was assigned to. The second room was better but still woke up with a headache the next morning. Standard breakfast selections but need more than one person attending. to keep it stocked with food and utensils. "Nice friendly staff remodeling now"
They hole is being remodeled right now. Replacing practically everything. Great staff. nice hot breakfast. Has very nice eating place right next door. Would stay here again. Hand off the freeway and to sites such as Surf Ballroom and Buddy Holly crash site. Hd one problem, Room 228 had very cold water in shower. Told desk and believe it will be fixed. the breakfast was bad the coffee even sucked the trains ran all night long the rooms were nice the hotel help were great... The bar lounge was nice 10% discount on my meal with prof that you were stay at hotel. they has good parking well lit. "When the ceiling drops out. on my head." Water ,from the shower happening in the room above mine, came gushing through the ceiling and landed on head while I was getting ready at 6:30am. The front desk manager, was not only unapologetic, she said it did't happen. She then went up and looked at the room above mine, then offered to dry my clothes & give me double points for 1 night of my multiple night stay. I have had to stay here for work before. I usually get put in some back lot Motel, it smells. The staff is constant - very uncaring and brash every time. Also, for the past 3 years I have not received any points for my stays because they set-up my rewards wrong. with my last name as my first name. They are always doing "construction" I'm only there late at night and it is still loud. I would stay Anywhere else! Beds are fine. I stayed for one night last weekend and was extremely impressed with this hotel. The customer service was excellent. Our room was clean and spacious. The breakfast was good. We will be staying here again! nice new updated hotel, felt like we were 100 miles away from home when we weren't. Prefect place for a short get away. Friends were getting married and they booked rooms at this hotel, trolley for the event where they had their wedding came right to the hotel to give everyone a ride, and then also brought everyone back. "trip to MN found good BW to stay at"
Average hotel. Clean room but lots of wear and tear. Nice to have the back door into the patio area when traveling with a dog. Staff was very nice. Standard breakfast selections. Adequate hotel for passing through town. "comfy bed, QUIET, filling all you can eat breakfast"
"Staf well worth the stay." Nice clean hotel. Fresh made cookies at check in. Most helpful friendly staff ever. Even sent someone up twice to help us run our remote twice because we couldn't figure it out. Nice continental breakfast in the morning. Really feel welcome. Friendly staff, helpful caring and plenty of stuff to do around the area. Pool was very warm and relaxing to be in. Some places it is to cold. Breakfast was excellent and was just the right temp. The lady in the Breakfast room was very friendly and willing to help or get what anyone needed. Hi, We went to Iowa for a visit & stayed overnight. This was a nice, clean, friendly hotel. Our son is a fan of Buddy Holly. At the lobby, they have a framed front page newspaper clipping of the plane crash from 1959. There is a Bennigan's Restaurant next door. Our room was clean & neat. The beds & pillows were quite comfortable. We had a pleasant short stay. ?? The people were all friendly and helpful. A great place and super location. Nice place for Class Reunions. The guest rooms clean and comfortable. The food was excellent. The exercise room needs a few more items. "Odors, No Elevator, Old, Strange Layout"
Awful place. We stayed only because we got caught on the highway in a terrible thunder storm. The hotel itself smells, the layout is weird (we had to walk through a dark, narrow, low-ceilinged tunnel to get to a tiny closet-like foyer where stairs (no elevator) led us to the third floor. It was a terrible place. However, Bennigan's Restaurant (attached to the hotel) was fairly good. I had a good sandwich and good service. In any case, find a different hotel. Very good, will always stay here when in this area,. Great service with shuttle to the Surf. Very friendly and helpful employees. Honored my room request. Don't change a thing. Will continue to seek out the Surf for concert and this is the only hotel I would stay at. Thank you for everything! "Susan is the bomb! Worth staying for breakfast." There is a funky mildewed smell in a lot of areas, and the hot tub (main reason I chose this hotel) was down for maintenance during my stay. Could get a much better rate booking through an online booking site than calling the desk (about $30 better). My interactions with the staff were nothing to be excited about until I met Susan, the attendant in the breakfast area. She is an absolute joy and genuinely spreads happiness and is just a wonderful first contact as you start your day! Take the time to have a conversation and let her know she makes a difference. Wonderful lady. "Great place to stay for Surf Ballroom events"
"Best motel in Clear Lake"
Definitely stay here when you are traveling through Northern Iowa. 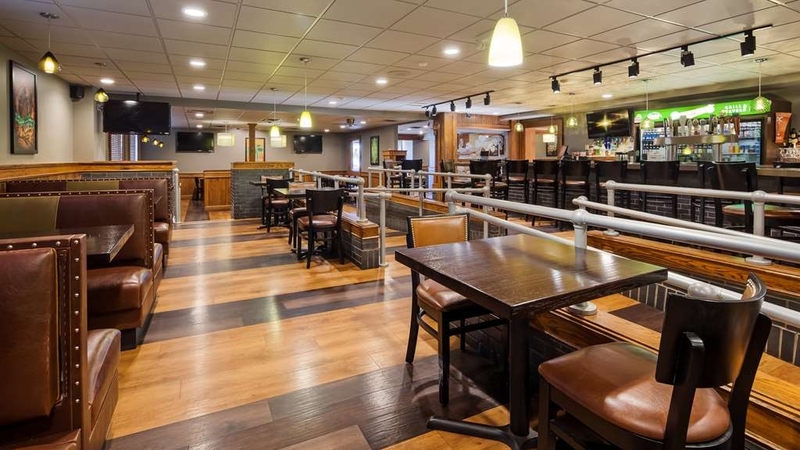 Easy access, clean, caring staff and good food at Bennigans. 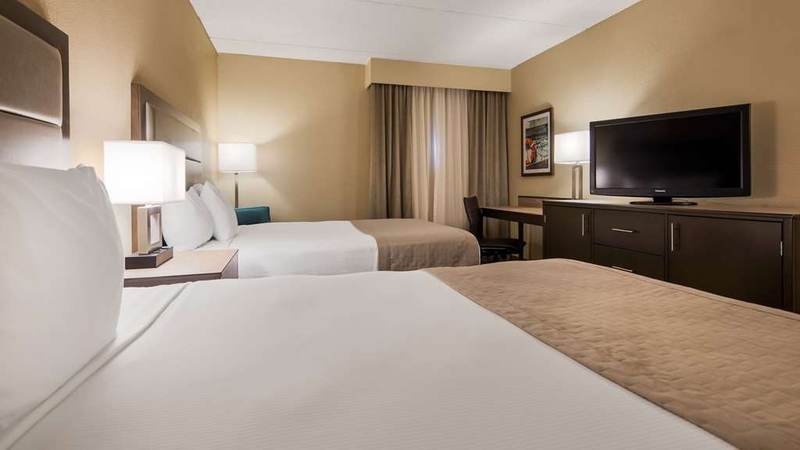 Recently remodeled has made the rooms very comfortable with large TV's and new bathroom cabinets and fixtures. Extra comfy beds, pillows not so much. Flat screen not in HD for some reason. Unable to adjust aspect ratio on TV, so trying to watch British Open all the scores and other graphics were off screen. Menu showed aspect ratio as " unavailable ". Continental breakfast was better than most. We arrived and were pleasantly greeted. Room was sufficient, 5th floor, back corner so very quiet. Rooms are a bit dated, but clean. The remote control is in a special holder indicating it was specifically sanitized. When we left, the front desk manager was cleaning the swipe cards! NEVER have seen that before but reiterated our opinion, they go beyond to keep the hotel sanitized as much as they can. My room was dated, but adequate for a one night stay. My partner, however, was moved because of a faulty room entry lock, then moved to a room with a broken air conditioner and wet carpet (air conditioning condensation?). Moving again or discounted rates was not offered by morning staff. Nor would they recognize our corporate rate. Will not stay here again, unless my rental car is too uncomfortable to sleep in. No discount for being a rewards member here and the bed we had was very hard and uncomfortable. Wasn't even asked how our stay was when checking out. The high point was the kitchen staff. They were friendly and had a good breakfast. "Friendly Service but rooms are below standard"
The service was nice and friendly. Rooms were clean. We got a great room that you stepped out to this small patio that cut across to the pool. Loved that!!!! Was a good price and no bugs! We had a great time. I stayed here 8 nights for a class. I was treated so wonderfully from the outset. The manager even gave me cough drops from the front desk so I didn't have to venture out late at night. The hospitality was great, the room cleaning was nice and the grounds were well taken care of. Would definitely stay again! "Last minute decision but worth it." We were planning on driving on to Albert Lee, MN and it was getting late. We called Best Western in Albert Lee and they were full so we called BW in Clear Lake and went there. The staff was very helpful being a late night check in and needing 2 rooms. We will definitely stay here again if we are in the area. I stayed here because there was a wedding reception in the same hotel. I only needed a place to sleep and the convenience of not driving was my motivation to stay. The people were delightful, the room was adequate, the checkout was quick. "Nice Hotel if you stay in the main building..."
We stayed in the unattached building in the back. It was very old, dirty, no elevator to second floor and had a very bad smell. I have no complaints on the service it was good and the staff was very nice, but if smells bother you I recommend if you stay at this hotel to make sure you stay in the main building. "Nice stay at Best Western Holiday Lodge"
Nice stay at the Best Western Holiday Lodge in Clear Lake. Room was comfortable, however, the hallway had the strong smell of paint - must have recently been doing some painting on that floor. I would suggest that they need more than one small elevator for a facility that is that large. Breakfast was OK but I have had better. We stayed here as guest of a wedding we attended, we stayed in a king suite. Lots of room for us and our son. Very clean and the bed was very very comfortable. Food on site for wedding was amazing and the service staff was very attentive. Pool area was clean and fun for the kids. Planning on staying here again if we bring the boat over to the lake! The room rate was advertised at $129, then I was charged an "occupancy tax" bringing the room rate to $141, why this additional charge? The room had a smokey oder although it was a non smoking room. Our room was never cleaned nor was I provided with fresh clean towels when I asked for them during our 3 day stay. The breakfast was very good. My husband and I are not typically that picky about hotels, but this one had several issues. Our first room smelled like smoke, although it was listed as nonsmoking. Thankfully, we got our room changed, but even then the hallways and many of the areas around the doors, pool, exits, etc. smelled like smoke. Our air conditioning unit cooled the room but didn't take moisture out, leaving all of our clothing damp. We were told that a two night stay was required for Memorial Day weekend, but our reservation somehow was confirmed for only one night. Even though we fixed this before our stay, it seemed duplicitous to tell us a two-night minimum was required but somehow it would have been okay for us to keep the original one-night reservation. Also, because of the holiday, the prices were raised, and combining that with the two-night minimum we felt our room was considerably overpriced. Clear Lake is really charming and I've been to the town many times before, but I will not stay in this hotel again. Easy to find, - Plenty of parking, - Friendly folks (customer oriented - gave me an upgrade after looking at my records) , Clean & quiet room with a good desk, chair, & internet, - Good breakfast served in a large bright dinning area. THANKS to those who make it happen! "Very nice swimming in the pool after walking all the hot day long"
We had a very enjoyable stay at this motel. The staff was all very friendly and accommodating. The room was clean and in order with everything working. Breakfast was provided and a great variety. However, we thought they were still a bit pricy. But the bed was bad for my wife. But I slept good. My daughter is handicapped and we had a handicap room. They called us when we go to the room and asked if it was okay. I said yes it was. We had door to the court yard. They went over and above to reach me as I left items in the room on our departure . I was so thankful for that, and that we weren't to far away from the hotel. On top of that I think she was even training someone... I was extremely awesome service, I will never forget! The hotel was ok. Pool was perfect for the kids. We didn't get to stay long enough to have breakfast. Hotel staff was helpful when we ordered take out and needed some utensils. The one draw back was there was hair in our shower before we used it. Gross! Clean friendly and easy to get to. Rooms and breakfast great. Would highly reccomended. Currently remodeling so it should even be better. Best place to stay at Mason City or Clear Lake. Staff is great and accommodating. 5 stars! I got into Clear Lake at 3:30 p.m. on a Tuesday, asked if they had a room (rhetorical question), and they said we have one (1) left. What?!!! Iowa on a Tuesday and booked. Apparently they fill up quickly and early for ever reason. My room was very clean, comfortable, and had all the amenities necessary. The breakfast was satisfactory and free. "Non smoking rooms next smoking rooms"
When I stay at a hotel and ask for a non smoking room, I expect not to have to smell cigarette smoke! The smoke rolls down the hall way into the non smoking rooms and you can't escape it! No windows to open!!!! If your not a smoker and don't want to tolerate the smoke, I would stay away from 3rd floor! "I should have slept in my car." It was almost 10 when we checked in. All the amenities were closed but there were no discounts. There is no kitchen or even a vending machine but we were told if we went to Bennigans next door we could still get something to eat. We went next door but were told we could only get drinks and my 15 year old couldn't come in. When I checked in I was told I was "in the back of the hotel." I drove to the back of the hotel after being denied at the restaurant and noticed the place is setup like a cheap motel with the doors directly opening to the outside. I tried to get into our room but couldn't get the key card to work after several minutes. I figured something went wrong with the encoding. I went back to the front desk to ask for a new key and was told I couldn't enter the room directly.. but if I went to the other side of the building I could get into a common hallway - and then I could open the room door from the inside. This seemed just a little ridiculous in a place that has regular snow storms that require the road to be closed. I went back to the door he described to find the card swipe machine was a different type than the room door - and had completely frozen over. I had to go back to my car and get an ice scraper to get into the building. It was 45 minutes between pulling up and finally getting into our room. When I tried to open the door leading outside so I could retrieve my bags from the car I found that the room lock was broken and the door was stuck shut. Pro-tip - a paper clip and a bit of engineering will keep the street light from shining directly across the pillows. A $100+ room for 2 means someone sleeps on a fold-away bed. The next morning we went down to breakfast at about 8:50. When I asked one of the ladies attending the breakfast buffet what time breakfast was over - I was told 10am. So - I thought I had plenty of time and decided to visit the rest room first. After about 15 seconds in the rest room the cleaning woman knocked on the door. I responded "someone is in here". In the next 3 minutes while I did my business she knocked 2 more times. Did she think I had magically escaped into thin air? She was incredibly rude. At this point I went to the front desk and asked for a manager. I complained to management about my entire stay - but they just looked at me with blank stares. When I got back to breakfast they were taking away all the food. Apparently they ACTUALLY shut down breakfast at 9am. I would have a better stay in my car. We stayed here one night on our way home from a family trip. It was clean and overall a nice stay, its an older hotel but the service was good and it was clean. Pool area was nice and the water was warm. 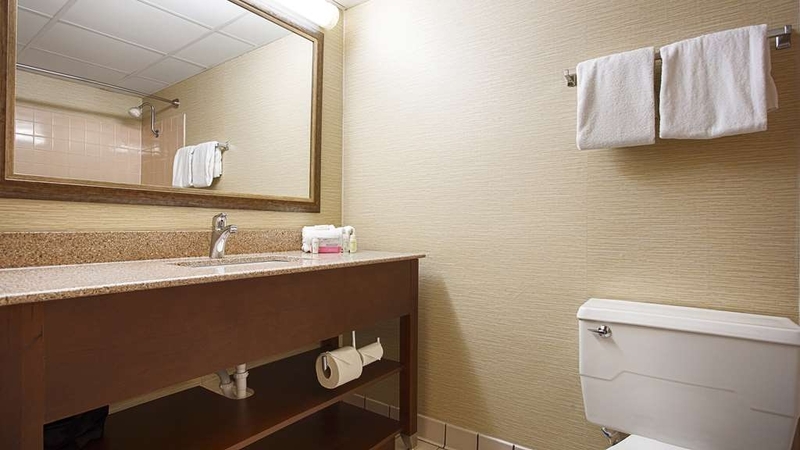 Overall the motel is good as long as your not expecting anything lavish. The night time desk person wasn't the nicest or most helpful, it was almost as if he was bothered by being asked questions. He was reading from his tablet and he acted as I was disturbing him by asking questions. But, overall the staff here are very nice and super helpful. For the cost it is a good place to stay. This hotel was clean and great for the value. Staff was friendly and had no issues. It's nice having a restaurant attached if on business. It was a centralized location and easy to commute around town. I love the service at this hotel. The ambiance and the people are just right. Bennigan's is great to have right there. Free breakfasts are good. Miss the waffle iron they used to have. Will stay there next year also. The beds leave a little to be desired,sot all that comfortable. But overall a great place. My wife and I stayed at the Best Western in Clear Lake, Iowa. We attended the Winter Dance Party at the Surf Ballroom in Clear Lake. As is always the case, we had a great time. It was our 27 year coming to the Best Western. Needless to say, we will be back! "Great Service at a Great Price!" I stay hear often when I have overnight immanence to conduct at work. The staff are always courteous, professional, and are willing to help me with any and every need. When you are in a pinch, this is the place to go to! Friendly, dedicated staff, strive to make your stay as enjoyable as possible and great service. Easy access and Bennigan's restaurant is attached to the motel. Great place to get a good meal and don't have to brave the cold to dine elsewhere. "Clean, quiet, GREAT customer service"
We ran into bad weather (ice!) on I-35 returning home Friday night and lucky for us we were close to this BW right when it really got treacherous. Easy check in, staff very upbeat and helpful. Nice room, very quiet, pet friendly! Bennigans attached, but also available for room service (plus a 10% discount if you are staying at BW). Hot breakfast and the dining area feels like you are in a small town cafe. The coffee mugs are a nice touch. We'll be back with friends to check out the lake as well as the rest of the town. Dairy-free blueberrry muffins were offered for breakfast-a rare treat! The rooms are very quiet. I have stayed here multiple times, and will continue using this as my go-to hotel when in the Clear Lake area. We got a same day deal on Hotwire for this hotel on Christmas Day. We have a child who is just a little too large for a pack and play, so they provided us a roll away bed free of charge, which was VERY much appreciated. It was brought up immeadiately from when we checked in. 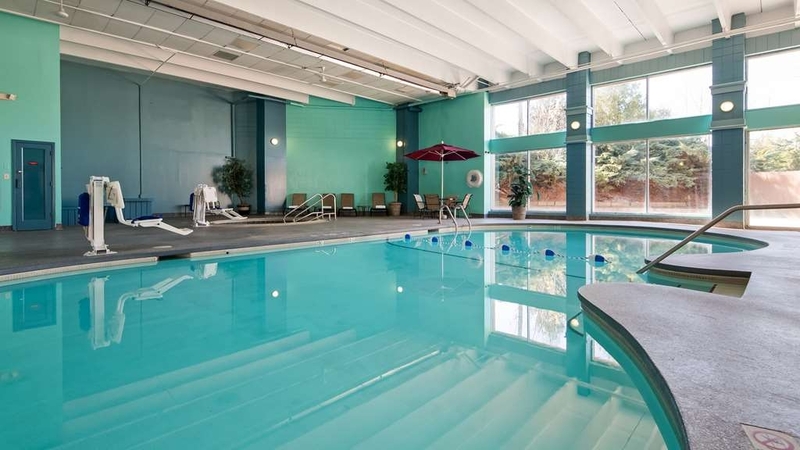 The pool space is decent- the kids liked having plenty of room to swim. Breakfast in the morning was good, it was nice to have some hot options, like eggs and sausage, included in a free breakfast. In general the hotel looks a little worn but everything was clean and functional. Be warned the elevator has to be one of the smallest we've encountered. For what we paid- I think it was $65-ish before fees and taxes, it was money well spent. Would stay again. "Shuttle to the Surf Ballroom - Priceless!" We were attending the New Year's Eve Celebration at the Surf and stayed at the Best Western as it had a restaurant attached and the price was reasonable. Had all the amenities we look for in a hotel - clean quiet rooms, check - coffee maker, check - refrigerator, check - free breakfast in the morning, check - free internet, check - and a surprise upon checking in- a shuttle to the Surf - PRICELESS! Also received excellent customer service and a discount at the attached restaurant. We were also pleased that we were not gouged on a price as it was New Year's eve. Spent under $100 for the night and was treated truly like a guest they were happy to have, much better than some $200/night places I have stayed. "Probably the best place to stay in Clear Lake, but thats not saying much"
Had to stop here overnight due to weather. Staff was friendly. Bennigans is attached and a decent place for a dinner or lunch. Our room was a little run down. Don't get me wrong, everything worked fine. The bed wasn't the best nights rest I've had. Think $99 bed at your local mattress dealer. Since it was me & the wife we both didn't sleep great. Free breakfast was decent... If I had to go back to clear lake I might stay here again. I would've rated it a 3 given if this was in Minneapolis or Chicago, but for Clear Lake it's probably pretty nice. "The staff treated us as though we were part of the family!" 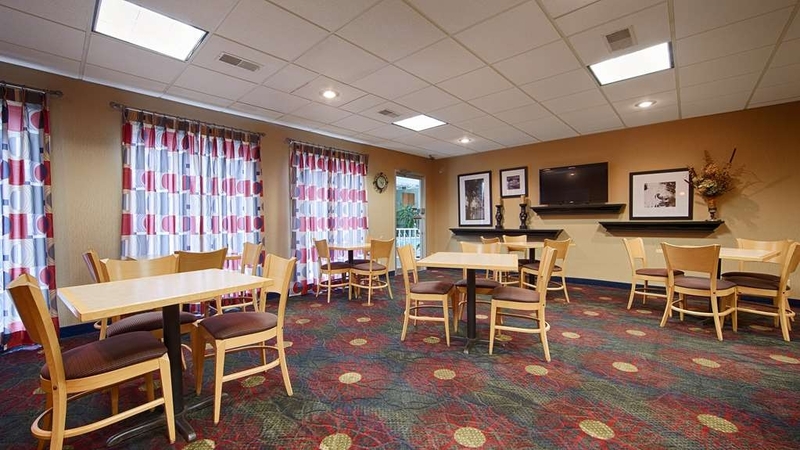 Comfortable, clean, and quite hotel with a superior staff. The gals at the front desk could not do enough to help us - from giving my sister band-aids for the blisters on her palms from driving to recommending a restaurant for dinner. The professionalism, courtesy, friendliness and service in this hotel is superb! 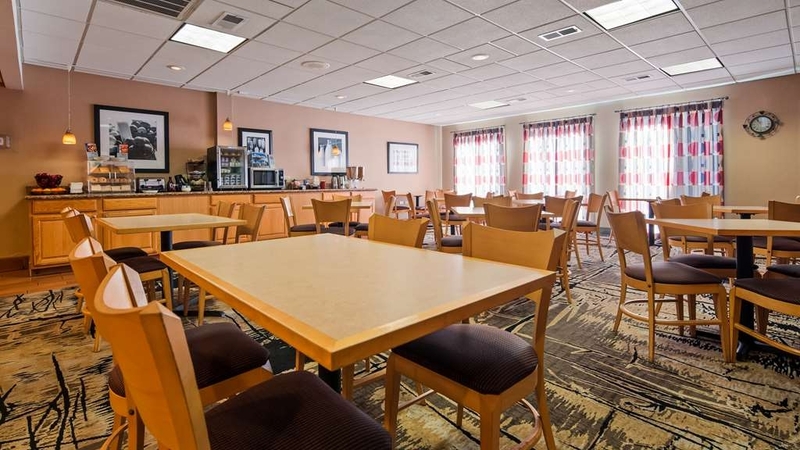 The location is convenient to the highway and there are several dining options close by. 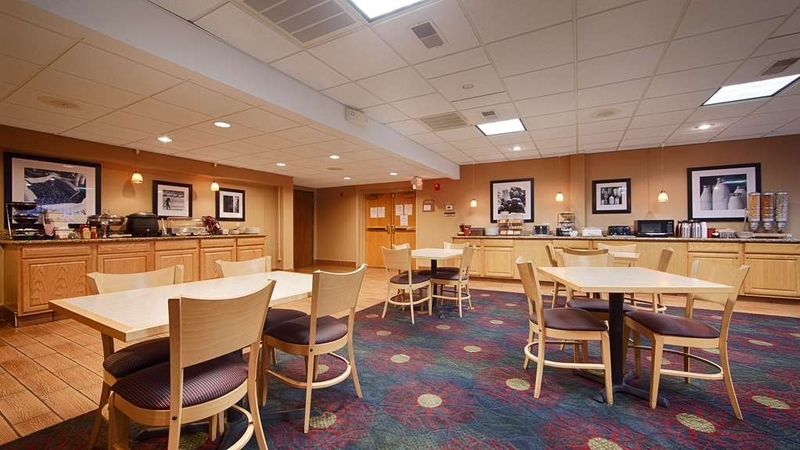 Nice comfortable rooms & clean also has a nice café to which may dine in the evening. Excess to refrigerator, coffee for you convenience. Well designed. Was easy to check in and out of their facility. Employees were very nice and polite. I was called in my room to see if I was happy with every thing. "Great place when travelling with dogs"
The hotel has been nicely updated. The room we had opened up into an enclosed courtyard area that was very convenient for our dogs. 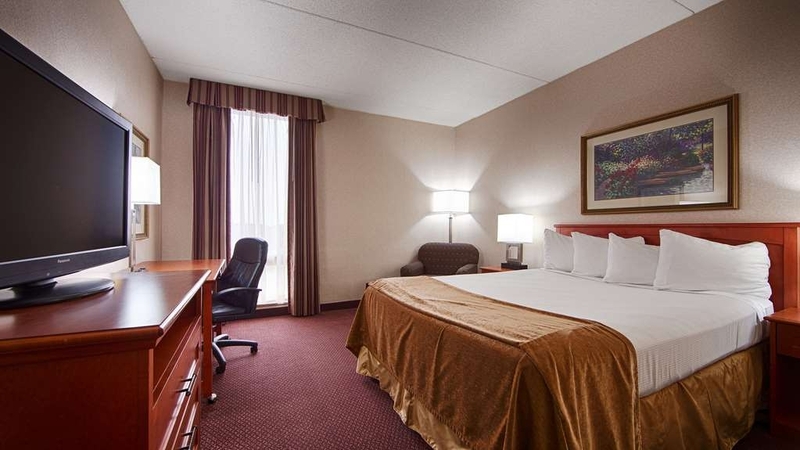 The hotel is conveniently located within about 10 minutes of local attractions. "Very satisfied with accommodations and employees." I enjoyed my stay and found the accommodations to be to my satisfaction. The service at both the hotel and restaurant were excellent. My stay was three nights while I visited relatives in the area. I would definitely decide to stay again if I'm back in the area sometime in the future. 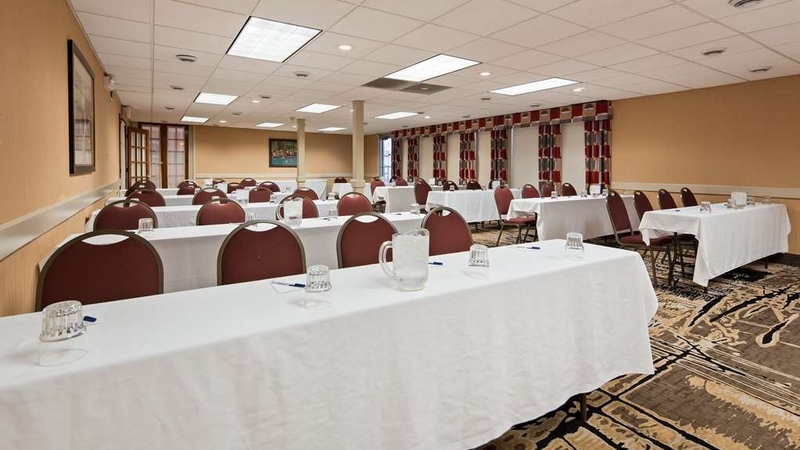 "Great place for an overnight business meeting"
Great place for an overnight business meeting. Handy and delicious Bennigan's Restaurant, convenient and roomy meeting rooms with wonderful catered meals. Rooms are nice and had very comfortable beds. The staff is more than willing to help any way they can. The food and drinks are excellent. Don't forget your swimming trunks for the hot tub. The motel is close to the highway but not noisy. I only wish it was closer to the lake. Nice clean hotel with very friendly staff and great service! Been coming for the past 5 years with my sisters, enjoy the ease of walking to the restaurant/lounge and then relaxing in a comfortable pool area. Complimentary breakfast was a nice variety of hot/cold entrees. Will come again! I drove a motorcoach carrying a college football team. We spent the night here before heading on for the game tomorrow. I found the accommodations clean and comfortable. The bed and pillows are just right for a good nights sleep. The staff is friendly and accommodating. Check in for 100+ players and coaches was quickly and efficiently done. Everything was ready when we arrived. I would gladly stay here again. 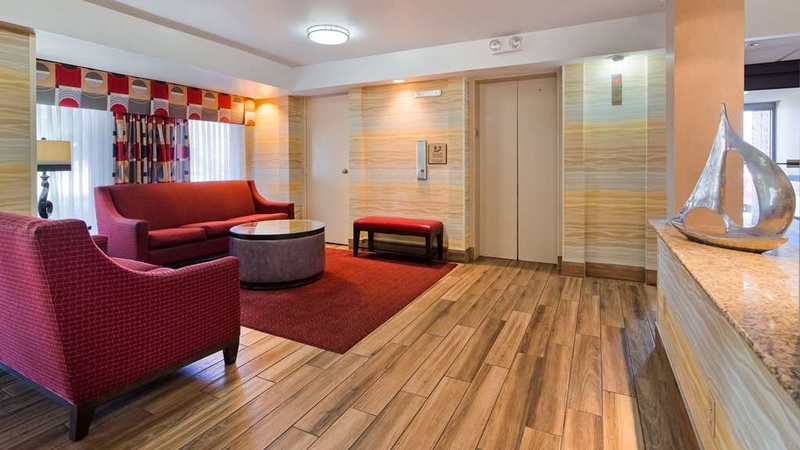 From the front door, to the door of our room, the service of the people and the cleanliness of the hotel are 10 out of 10. Then we enjoyed the pool and the hot tub of which both were just the right temperatures. Best Western was a great place to stay in Clear Lake. The beds were comfortable. Fridge, microwave and coffee maker in the room for convenience. The breakfast had such a nice variety for everyone. The pool was perfect for us to take the grandkids into. I would definitely stay here again. Our only problem was that there were no handicap accessible rooms available for our daughter. The place was full to capacity.